Alfred Charles William Harmsworth, 1st Viscount Northcliffe (1865-1922), known as Lord Northcliffe, was a leading British newspaper publisher. Through his newspapers he sponsored many special events and competitions. 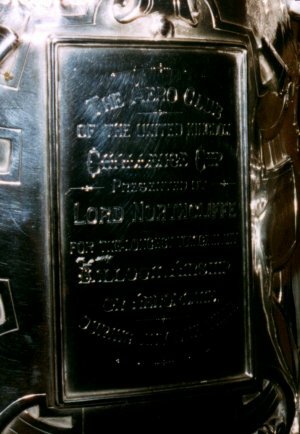 The Northcliffe Cup was presented by Lord Northcliffe to the Aero Club in 1906, to be awarded annually on the first of January to the Briton who made the longest flight during the preceding year. John Dunville Dunville, CBE, DL (1866-1929) won the cup in September 1907 by flying the balloon 'La Mascotte' nearly two hundred miles from London to Wales. 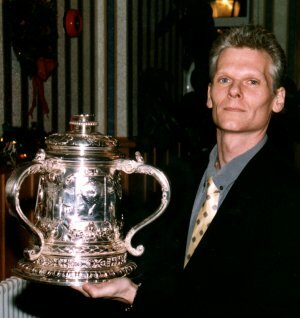 John Dunville won the cup again in December 1908 by flying from Chelsea Gas Works to Crailsheim near Stuttgart in Germany, accompanied by Mr. C.F. Pollock and Philip Gardner, in thirteen hours. 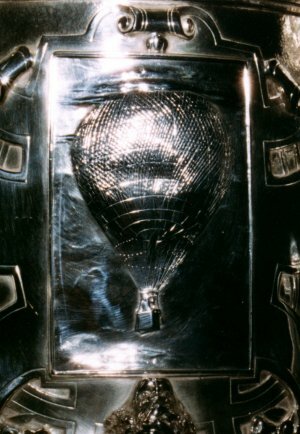 One of the rules of the Northcliffe Cup was that if it was won by the same person in two consecutive years it became the property of the holder, and thus it became the property of John Dunville. Colonel John Dunville was the Commander of RAF Aldegrove upon its inception. When he was buried it was with full military honours and a band from the base. 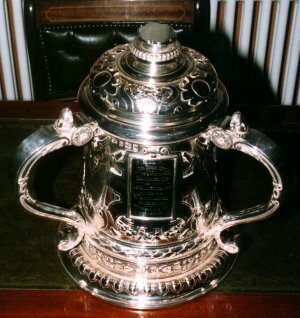 Mrs. John Dunville later presented the Northcliffe Cup to the Officers' Mess at RAF Aldegrove, where it is kept today. Christopher Dunville (right) is a great-great-grandson of Colonel John Dunville. These photographs were taken by Sam Christie. We plan to add more photographs taken by Sam Christie to the website.